There was an eerie hush as crowds of people filed quietly past Karen Sullivan’s opening of drawings and paintings at First Street Gallery in Eureka, Ca.. The exhibit is showing work from 1989 until the present; work largely based on dreams, intuition and spontaneous drawings. Three good sized rooms offering pen and ink drawings, gouache paintings and an installation of years of post-its in 12 feet strips of 6 columns deep cascading to the floor; 3 by 5 inch drawings enclosed helter-skelter in a glass case center stage with their digital counterparts across the way. Paper, lots and lots of paper, tacked to walls, mounted on canvas, encased in plastic; their own 8.5” by 11” space, each a separate entity. Karen Sullivan has been making art since the 1970’s. A sculptor first, not taking her automatic drawings too seriously until a Los Angeles art dealer told her they should be. The doodles or spontaneous drawings were born 15 years ago while caring for her sick mother; notes written of medication during phone conversations of a wandering mind were accompanied by images symbolic of unsaid feelings and subconscious unthoughts. Traumatic events have been a springboard or awakening for many an artist. The great Louise Bourgeois’ work was based on memories of parental betrayal. Jim Nutt, a painter of caricatures from the 60’s, and one whom Sullivan feels an affinity, depicts emotion, or lack of, through his portraits of women, usually as a stand in for his mother. For Karen Sullivan, the wealth of childhood memories and a lively unconscious have created endless scenarios for her “stories”. Upon entering Karen Sullivan’s exhibit the first gallery seems to hit this observer hardest. It’s the small room housing three series: the E + F, Llama Longing and Chi-Co Longing series. There is a weight and heft to the drawings that belie their outward delicacy and sweet cartoon-like appearance; closer scrutiny reveals a darker nature. One notable drawing is #8 from the Llama Longing series, a fairy princess-like figure clad in a long pink ballerina skirt set atop shorthand paper on a “paper bag” brown background. The shorthand notes from her mother’s own hand still contain a mystery for Sullivan encouraging “an ongoing revisiting of unfolding scenarios”. Her recent paintings in gouache have turned to more narrative explorations as the title of the show, “Not As It Seems” implies; stories that are endlessly in transit and flight now interchangeable scenarios rife with possibilities. She has to hurry to catch those fleeting dreams up for interpretation of never ending changing times. Her new paintings and drawings symbolic of important events : Sullivan’s father’s death in 2004, the destruction of the family cabin in Redway, Ca. , loss of childhood memories and awakening of environmental concerns; more conscious, less subconscious. A new dimension was added to Sullivan’s work and the Diver series was born. Rather than attempting to get inside Sullivan’s mind for a better understanding of the complexities these series present, it might be better to make up ones own scenario. Sullivan implies the content of her work is up for grabs when she says “there is a suggestion of narrative”; sometimes the ‘dance’ in Sullivan’s head stays the same, sometimes not, autobiographical sometimes, sometimes not. More just the delight of drawing, “making the marks’ and its implied sense of magic”. Karen Sullivan’s work is charged with emotions but she states her work is concerned with “keeping the lid on”; just the thrill of exploring it is all that matters , going for the ride. Moving into the center of the space it seems that the content and weight shifts as the paintings grow larger and more colorful. 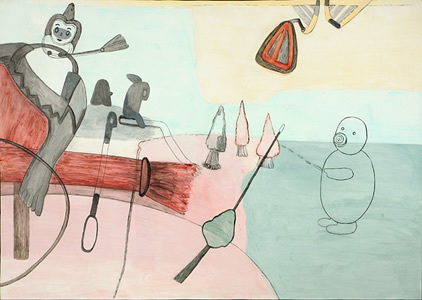 Luscious is the mint green pig in Diver #2, Redway, with his large round spirally snout and rosy red divers painted on gorgeous powder blue softness in Diver #3, or an indifferent pig in a black suit as in E+F #19 surrounded by sandy beach hues and a stranded boat afloat in Sullivan’s studio, no less. Darkness is diminished with the larger new paintings. She says they’re primarily about denial versus honesty and the tension of duality. The small Llama Longing and E+f series with their stark paper bag brown background hold a special intensity for this writer. Karen Sullivan was born in Oakland , Ca but has lived more of her life in Eureka, Ca. She received her B.A at Humboldt State University. Her teaching credentials include Art Supervisor at Eureka City Schools from 1980 to 1984. Sullivan taught at College of the Redwoods also in Eureka, Ca. Selected exhibits to her credit are notably “In Pursuit of the Invisible” at Morris Graves Museum, Eureka, Ca. , 2005 and National Juried Competition: Works of Art On Paper, New Jersey, 2007. Limn Gallery in San Francisco, Ca from 2004 to the present. Karen Sullivan has work in several collections, notably the permanent collection of the Triton Museum in Santa Clara, Ca and Humboldt Arts Council, Eureka , Ca., also the College of the Redwoods , Eureka, Ca. is the focus of this body of work”. Making magic happen.